Manufacture of Sheet Metal Components, Plastic Molds, Sheet Metal Tools and Complete Assemblies for Automotive Application. Design and Manufacture of Sheet metal Components and Window Regulators. 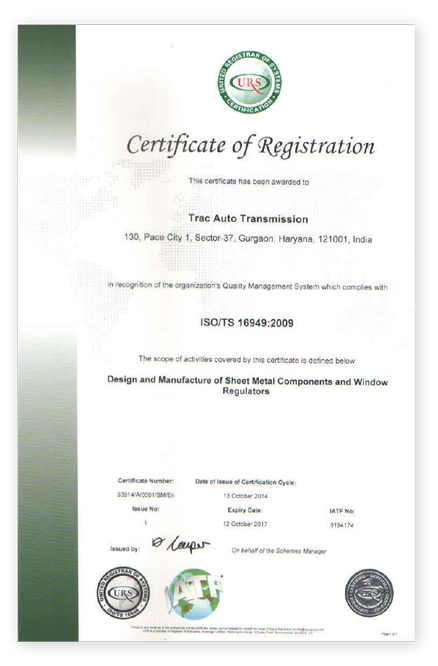 We at TRAC are committed to supply products that will exceed customer’s expectation by constantly redefining our quality standards. “To maintain an environment for teamwork and continuous improvement, leading to total quality in all activities of the organisation”. Our focus on providing products and services of International Standards offer a competitive advantage to our clients and adds value to their businesses. Upgrading the competency level of employees. Reducing waste at all stages. Reducing cost of poor quality and continuous cost reduction.